Discussion in 'Art & Design' started by gius, Aug 21, 2009.
first up... an Elephant ! Abstract art! Wow! Smart animals. is the elephant's work considered abstract too? (their) artwork is sold at the zoo's gift shop to raise funds. But officials have recently discovered that animal lovers willing pay hundreds - or even thousands - of dollars for the creatures' creations, prompting zoos across the country to study whether their animal artists might be an untapped source of revenue. Sea lions ply the painting trade with their mouths - they hold a stick in their teeth from which a paintbrush juts out in a T shape. But when they don't want to paint, no amount of cajoling can convince them otherwise, said Henry Kacprzyk, a curator with the Pittsburgh Zoo & PPG Aquarium. "If they don't want to participate, they'll just ignore you, they'll leave," he said of his zoo's three sea lions. "There's not much you can do - they swim faster than we do." Artistic "talent" seems as diversely distributed among animals as among humans, zoo officials say. Just as some people are more artistically inclined than others, so, too, is the case for chimps, elephants and so on. Some animals are eager participants while others turn up their noses - or trunks - at the sight of a brush. Of course, beauty - and artistic talent - are in the eyes of the beholder. People who buy animal paintings are rarely art aficionados. Instead, they're typically animal lovers who know the money is going toward a good cause. (© 2009 The Associated Press. All Rights Reserved. "She really seems to enjoy painting - she likes creating new things," elephant trainer Danielle Faucett said. "But we only do it about once a month because we want to make sure the activity remains mentally stimulating." Brittany is an eager artist. Her ears flare out as she attacks the canvas, swiping at it almost like Zorro wielding a sword, and she finishes in a matter of minutes while Faucett coos words of encouragement. The elephant was taught how to paint elephants, but I still find it amazing. Humans have to be taught how to paint humans, too. At eight years old, Hong maintains a very curious nature. She loves to investigate everything and once managed to use her trunk to open the door of a truck. This kind of curiosity made Hong a natural candidate for artistic instruction. Awh. Thank you so much. Haha I can imagine an elephant swiping her canvas Zorro like. Such amazing talented God gifted animals! So abstract, I love it. Wow, she was taught how to paint other elephants? They're so clever! I think humans underestimate other animals a lot. All they need to do is respect their intelligence and they're capeable of great things. When I saw the title of this thread, I immediately thought of Pet Star on Animal Planet, the one where Mario Lopez hosts Love that show. The elephant drawing an elephant is amazing! Paya was born in 2002. He can be a bit sullen at times, but does very much enjoy his time at the easel. Paya will often swing a leg, dance, and smile when he is painting. Having just started one year ago, it is astonishing how quickly Paya has excelled at creating figural works. Paya has developed his own slow concise style of art making. More drawing than painting, he specializes in creating elephant heads. Paya is very slow and deliberate when working, but this can be expected as he creates the astonishing compositions that he does. With exacting control, Paya draws one slow deliberate line at a time. To see it is breathtaking, as the subject of Paya's focus slowly takes shape before your eyes. HAHAHA YEAH! I used to love that show!! Me& Gius were just talking about that last night! How funny. hehe oh this is the cutest thread..
Pelmus: "Just like many artists, animals work by instinct, creating art without realizing they are creating art"
When it comes to nature, there's little doubt that mankind is sitting comfortably atop the proverbial food chain. Humanity's dominion over the art world, on the other hand, might just be a little more precarious thanks to Animal House: Works of Art Made by Animals, a fascinating new exhibit taking place at Ottawa's SAW Gallery.The concept of animals creating art isn't nearly as esoteric as it sounds. Indeed, since the late 1950s, art made by animals has become a thriving, if not oft ignored, industry existing on the periphery of the contemporary art world. Early paintings from chimpanzees, for example, captured the public's attention due to their often striking similarity to the abstract and impressionist movements of the time, while more recent paintings from trained elephants are currently en vogue among collectors. Animal House, however, may just be the first exhibit to present an in-depth and all-encompassing look into this rarely seen artistic world. The exhibit is the brainchild of SAW Gallery's curator Stefan St-Laurent, who was inspired by his own growing collection of animal art. "Initially we wanted to look at the exploitative work coming out of research and wildlife preserves and offer a critical viewpoint," says St-Laurent. "But the more we looked into it, the more we decided that we really wanted to offer a comprehensive experience so people can appreciate the intellectual and creative capacities of animals." The family-friendly exhibit offers up three different kinds of animal art: works from trained animal artists, naturally occurring animal works, and collaborations between animal and human artists. 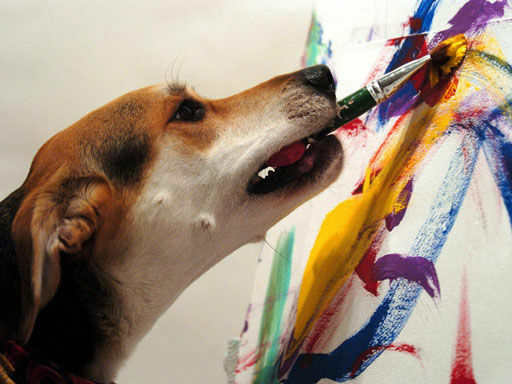 Among the roster of artists on display are some of the most prolific of both the two-legged and four-legged variety. Carry on the Back, for example, is a lush, multicoloured painting created by Ramona, a trained elephant artist from the Maesa Elephant Camp in Thailand. The abstract painting looks almost like something one would expect to find on the wall of a contemporary art gallery and seems to have a surprisingly complex structure, and the deliberate brushstrokes of a skilled painter. Similarly, Tongue Tied is a beautiful and strangely fascinating abstract work painted by Kamala, an elephant from the world renowned Calgary Zoo. Among the more naturally occurring works featured on display are a variety of bird's nests and other animal creations referred to as "unintentional animal art." The exhibit also features works from three local Ottawa artists who were commissioned to recreate naturally occurring animal structures. Among these artists is sculptor Theo Pelmus, who was given the daunting task of creating realistic African swallow nests. "The nests actually look like beautiful sculptures," says Pelmus. "So I made them from clay to try and stay as close as possible to the materials the birds actually use. This is a challenge as an artist, because when you try to imitate nature it's very difficult." To facilitate the process, Pelmus says he spent a great deal of time researching the nesting habits of the swallows and says that the real challenge is trying to think like an animal rather than an artist. "There's a fine line that separates animals and artists," says Pelmus. 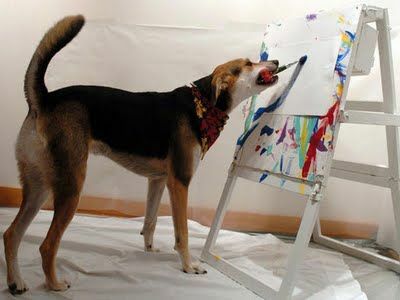 "Just like many artists, animals work by instinct, creating art without realizing they are creating art." One of the more fascinating aspects of Animal House, however, is undoubtedly the collaborations between animal and human. Of particular note are several works from celebrated '60s artist and feminist icon Carolee Schneemann, who has incorporated her three cats into a series of works. The most visually striking human and animal collaboration, however, may just be Harlequin, an almost iridescent abstract painting created by Koopa, a box turtle from Hartford, Connecticut, who "paints" by crawling across a canvas, creating unusually complex shapes and patterns. There are also several fascinating pieces from Tilda, an orangutan from the Krefeld Zoo in Germany who works closely with a local collective of artists to create collaborative abstract paintings. St-Laurent, however, is quick to point out that while art by animals is indeed an amazing phenomenon, it also raises a number of ethical questions given that in most cases the animals are held in captivity and carefully trained by their handlers. "Trained animal art is an important parallel art market that's virtually unscrutinized," says St-Laurent. "As a community of artists at the SAW Gallery, we felt that it's our job to bring these questions to the public, and the purpose of the exhibit is really for people to reach their own conclusions about animal artists." When it comes to the notion of animals possessing artistic talent, however, St-Laurent is quick to come to their defence. "Animals are definitely creative," he says. "But they can only express that creativity when they're in the wild or in a relationship with humans that's based solely on love and respect."